This website is dedicated to the McGuinness Institute’s signature book, Nation Dates: Events that have shaped the nation of New Zealand. The third edition of the book was published in October 2017. Along with the revised and updated timeline to 30 June 2017, the third edition of Nation Dates includes chapters on Heads of State, Governors and Governor-Generals, Royal Commissions, political party genealogies and more. On 1 April 2018 the McGuinness Institute launched Nation Dates 365 on our social media platforms. The ‘On This Day’ series uses excerpts from the third edition of Nation Dates; posting one on each day of the year. Selected events from the book will be shared in calendar order and aim to highlight some of the most significant dates in New Zealand’s history. With Nation Dates the Institute wants to illustrate just how much New Zealand’s past influences the present and future. These posts will demonstrate New Zealand’s diverse history and serve as a reminder both of how far we’ve come, and how much more there is left to do. Visit LinkedIn, Twitter or Facebook and look for the hashtag #NationDates365 to stay updated. To learn more about the third edition of Nation Dates, see here. See below for references. If you are interested in purchasing up to five copies of the book, see here. If you are interested in purchasing the text wholesale, please email us at nationdatesnz@mcguinnessinstitute.org. 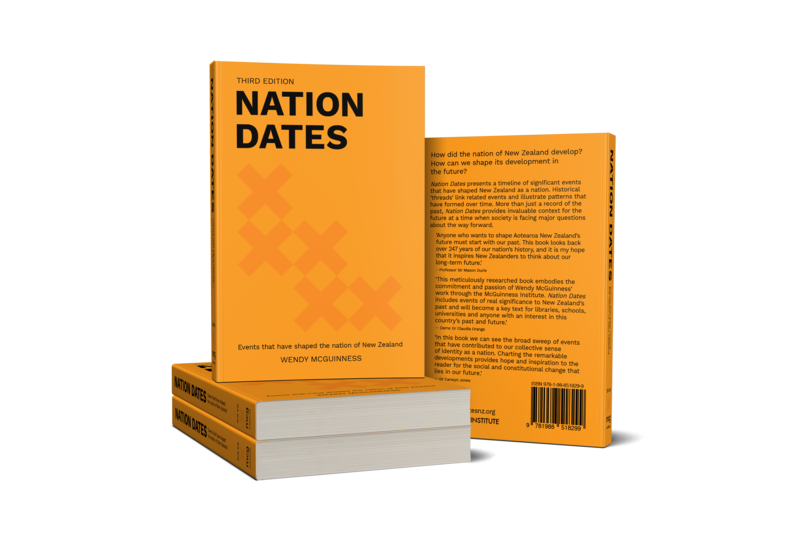 We are looking to publish the fourth edition of Nation Dates in 2019. If you have any suggestions for events that could be included in the fourth edition, please see here for more information. This website also contains information on the Nation Dates 3rd edition references. The table of references A–M with links can be found here. The table of references N–Z with links can be found here.